Port Elizabeth-based painter and art lecturer Dandheni Andrew Nhlangwini feels a deep resonance with George Pemba's work and leapt at the chance to take on this project. "Since my student days, I admired his courage and his work - he recorded his people's life through visual images," Nhlangwini says. "He suffered as an artist, but he decided to stay here in South Africa, where he documented the history of township life." Pemba toiled for much of his life in what he called "the wilderness". He lacked both formal art training and recognition, although nowadays he is regarded as one South Africa's leading artists and his work is highly sought after. Nhlangwini adds: "As an art lecturer, I know for a fact that South African art is not recognised. As an example, my students don't even know who Pemba was." His artwork is both a tribute to Pemba and a means of bringing the memory of the artist into the public domain. 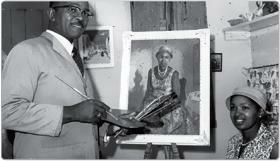 Nhlangwini has created a double-sided watercolour of George Pemba, with paintbrush and palette in hand. Pemba painted exclusively in watercolours until he was advised to switch to oils. He later returned to watercolours. Nhlangwini's painting has been digitised, printed on vinyl and installed behind a protective cover that is weatherproof, similar to an outdoor illuminated sign. A ribbed effect gives it an old-style feel and it sits atop a 3.5m-high pole made of mild galvanised steel. "To place an artwork in the public space - rather than hanging it on somebody's wall - will make people feel that they own it, that it belongs to everybody," Nhlangwini says. "This public art project, in the form of a billboard painting or mural art, will be an open-life gallery for South Africans, as well as other people, to see and remember who Pemba was." The site of the artwork is the home Pemba lived and worked in for 40 years - 28 Ferguson Road, New Brighton. Today, it is the base of the George Pemba Art Foundation. It is situated on the main road running into New Brighton, visible to all who pass by.